Whether you're looking to enjoy a day out boating or you're after the one that got away, the Garmin GPSMAP 556 offers the brightest, sharpest graphics seen on a 5-inch screen. Garmin GPSMAP 556 is preloaded with Garmin BlueChart g2 UK and Ireland mapping. On the water for easy marine navigation with no compromise - optional BlueChart g2 Vision cartography provides comprehensive marine charting and 3D views above and below the waterline. Garmin GPSMAP 556/556s has been discontinued. Accessories, spares and parts are still available for your GPSMAP 556/556s, as are marine BlueCharts. Garmin GPSMAP 556 is a compact chartplotter that features a high-resolution, super-bright 5-inch VGA colour display along with an improved high-speed digital design for increased map drawing and panning speeds. It’s ready to go with an easy-to-use interface and a built-in, satellite-enhanced basemap preloaded with Garmin BlueChart g2 UK and Ireland marine charts. Garmin GPSMAP 556 also accepts BlueChart g2 Vision cards for added features and functionality such as high-resolution satellite imagery, Mariner’s and Fish Eye views and Auto Guidance technology. The Garmin GPSMAP 556 comes ready to go with preloaded marine charts for the UK and Ireland. For all other areas, the Garmin GPSMAP 556 has a worldwide basemap with satellite images in place of more traditional maps. The Garmin GPSMAP 556 also comes standard with a high-sensitivity GPS receiver for superior satellite tracking and quicker acquisition times. And with an SD card slot, it’s easy to add additional maps without connecting to a computer. ‣3D mariner's eye view or fish eye view provides you with a 3-dimensional perspective of chart information, both above the waterline and below it. ‣High-resolution satellite images and aerial photographs help you orient yourself in unfamiliar areas. ‣Auto Guidance technology searches through all relevant charts to create a route you can actually follow - one that avoids obstacles, shallow water, buoys and other obstructions. To find the perfect transducer to partner your GPSMAP 556s and your boat please complete our online form here. Pictured below, transom mounted transducer, thru-hull transducer and in-hull transducer. Garmin GPSMAP 556 marine chartplotters are preloaded with Garmin BlueChart g2 UK and Ireland mapping (pictured right). Coverage across the English Channel from Douarnenez, France to Emden, Germany, including the Channel Islands, and the Seine River to Rouen, France Detailed coverage includes Antwerp, Belgium, Rotterdam, Netherlands, Amsterdam, Netherlands, and the Ijsselmeer in full. In future years you can purchase a marine map update SD card to update the preloaded UK and Ireland charts on the Garmin GPSMAP 556. 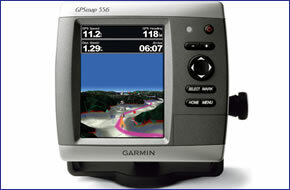 Looking for Garmin GPSMAP 556 or GPSMAP 556s accessories? Accessories available to purchase include protective cover, flush mount kit and second mounting station. To view them all click here. If you'd like to add a transducer to your GPSMAP 556s please see this page. Add Garmin BlueChart g2 HD and g2 Vision HD marine charts to your Garmin GPSMAP 556/556s, view the different charts you can buy from ActiveGPS here. Question: I own a GPSmap 556 for use on my boat. How do I update the charts. If there was an internet cable which came with it, I cannot find it! If such a cable exists how do I order it or do I need a new card? Answer: I can confirm that no such update cable exists. In order to update your Garmin GPSMAP 556 preloaded charts you will need to buy the BlueChart g2 UK Ireland Update SD card. If you however you want a different region or to upgrade to the g2 Vision HD version you will need to buy a new chart. Do you have a question about the Garmin GPSMAP 556? Submit your question via our contact page.